Researchers pleased with unfettered funding for granting councils. Canadian Prime Minister Justin Trudeau’s administration released its 2018 budget on 27 February and scientists couldn’t be happier. It includes almost Can$4 billion (US$3.1 billion) in new funding for science over the next five years, a significant portion of which will go to the country’s three granting councils. This is in contrast to the Can$1 billion in new science funding contained in last year's budget — almost none of which went to basic research. 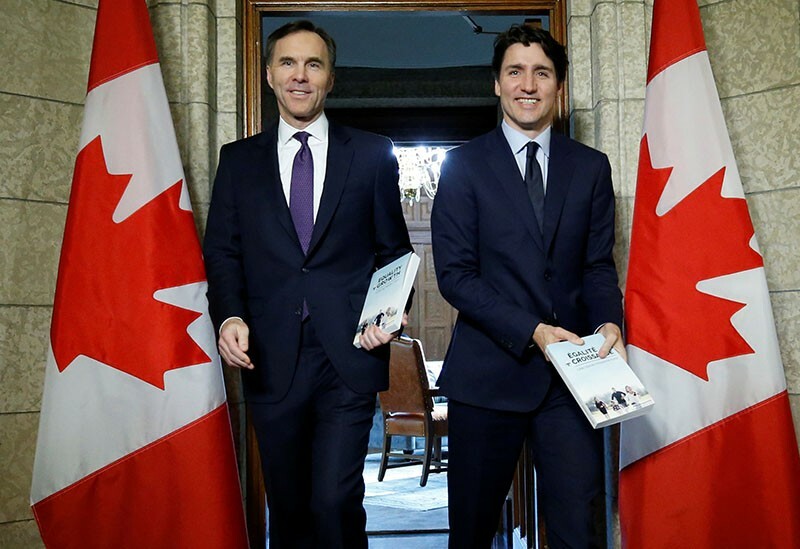 The latest budget is “the single largest investment in investigator-led fundamental research in Canadian history,” said finance minister Bill Morneau in remarks to legislators on 27 February. The Natural Sciences and Engineering Research Council and the Canadian Institutes of Health Research will each receive Can$354.7 million, while the Social Sciences and Humanities Research Council will get Can$215.5 million. All three councils will share another Can$275 million to support research that is “international, interdisciplinary, fast-breaking and higher-risk”. Much of this money will be reserved for early and mid-career researchers. The councils didn't receive any new funding in 2017, and have only gotten tens of millions of new money in past years. Scientists had been lobbying Trudeau’s middle-left Liberal government hard for an unrestricted boost to granting-council budgets, as opposed to funding earmarked﻿ for specific research projects, which has been a hallmark of previous years. The move follows recommendations from last year’s Fundamental Science Review, a report by an expert panel led by former University of Toronto president David Naylor. He was “relieved and pleased” with this “historic recalibration” in science funding. “They seem to have read the report more carefully than most governments,” he says. Others were equally pleased with the result. “The government went further towards meeting the recommendations of the Naylor report than anyone expected,” says Alan Bernstein, chief executive of the Canadian Institute for Advanced Research in Toronto. The budget includes Can$763 million for the Canada Foundation for Innovation (CFI), which funds research infrastructure. The government has also pledged to make this funding permanent — in line with the Fundamental Science Review — with an annual budget of Can$462 million by 2023. Until now, the CFI was funded only in ad hoc chunks every few years. Early-career researchers got a boost, in the form of an extra Can$210 million over five years for the Canada Research Chairs programme. The programme supports scientists at universities across the country, and the money is reserved for young researchers. In fact, the "running theme" of the 2018 budget seemed to be focused on early career researchers, says Tina Gruosso, vice president of communications for Science & Policy Exchange, a Montreal-based campaign group run by graduate students and post-doctoral fellows. "We were really happy to see significant steps in the right direction." But scientists didn't get everything they wanted. There was no mention of renewed funding for the Climate Change and Atmospheric Research programme, which is set to end this year. Without an influx of cash, several of the programme’s research stations in the high Arctic will have to shut down. Only one station, the Polar Environment Atmospheric Research Laboratory (PEARL), received money to keep going until 2019 when the government provided Can$1.6 million last November. Matt Jeneroux, the shadow science minister from the opposition Conservative party, says that the budget leaves many questions unanswered. They include the future of specific projects — including PEARL — and long-term support, beyond the next five years, for the granting councils. “There’s lots of colourful language, but I’m not sure what it means when the rubber hits the road,” he says. Despite that, Gibbs says this budget is a testament to the campaign waged by Canadian researchers over the past year to ensure that the government took the recommendations in the Fundamental Science Review seriously. “It really shows the government spent the last year listening to the community,” she says. Update 28 February 2018: This story has been updated with comments from Tina Gruosso, vice president of communications for Science & Policy Exchange in Montreal.